Probably the biggest vinyl release since the reissue of Pink Floyd's Dark Side of the Moon. Really, how much bigger than Brothers in Arms can it get? One of the greatest and most popular records of all time, mastered by Stan Ricker and pressed on 180-gram virgin vinyl at Record Technology, Inc. The nine songs are even spread out over two pieces of vinyl (four sides) to optimize your cartridge's trackability. THIS IS HUGE!! Dire Straits' biggest-selling album — in fact, one of the biggest-selling albums worldwide of all time — Brothers In Arms helped musically define a decade. A sophisticated rock masterpiece, the 1985 album reached No. 1, stayed there nine weeks and is nine times platinum. "Money For Nothing," the song that helped immortalize the phrase "I want my MTV," hit No. 1 and won the Grammy for Best Rock Performance. Today, Brothers In Arms remains a rock essential — and now is offered as a two-disc vinyl album. Customer Reviews (4.64 Stars) 22 person(s) rated this product. From reading all the reviews about sound quality .... Folks, this so called record is a CD made into vinyl. It was digitally recorded, mastered, and transferred. That means that the vinyl can approach the digital but not surpass unless you start all over, which they did not. I own this record, along with the original blue guitar etched original CD, and 1985 vinyl.... The CD in my estimation is the pinnacle and the vinyl gets close. Can't stop listening to this album. Every track is fantastic! The best of Dire Straits sound in the best form yet. Job well done. Sonically this modern reissue is average. I have (5) US originals from 1985 and my best side 1 simply has more life, energy & drive than this reissue. The vinyl is quiet and it has very good detail but there is a softness to the overall sound. Not all of my original pressings sound good but when you get a Hot one you know it by the superior dynamics, energy and power. My rating of (3) stars are is for sonics only. I would give it (5) stars for quiet vinyl, powerfull bass and detail but where is the life in the music? All I can say is I have been awakened to the pure joy's vinyl can bring, masterful recording. Better than the original, by a little. Still an excellent presentation. The cut Why Worry draws a huge soundstage out of a black background as well as just about any album cut I've heard anywhere. Sorry to say, I found this pressing to be lacking in comparison to my Quiex vinyl version mastered by Doug Sax. "Something" is clearly missing in terms of slam and bass weight. Oh, the upper end is smooth, but some life has been drained out. I sold mine on ebay and now listen to the Quiex version. I believe that Stan Ricker cut this from a digital source, which I believe is the reason for what is lacking with this pressing. only want to add to all the positive and deserved comments that you not be disappointed, its worth the price...buy it! Un - fregrin' - believable! 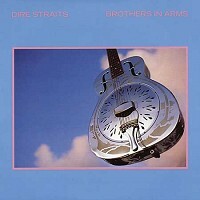 If you even remotely like Dire Straits, you've got to get this two-LP set of Brothers in Arms. It flat blows away any other pressing or format of this album. When I first heard it, I was not prepared - I was in total disbelief that anything could this good. I can honestly say that this is the best remastering job on any album that I've ever heard. vERY SURPRISING FOR ONE WHO WAS ONLY FAMALIAR WITH SOME OF THE COMMERCIAL WORKS OF THIS GROUP.........I WAS PLESANTLY SURPRISED AND IT IS IN THE FRONT OF MY ALBUMS........VERY NICE. Stan Ricker's remastering of this album is an astonishing feat, revealing nuance that was previously hidden, displayed against an absolutely silent background. Limiting each side to only a couple of songs not only enhances the experience, but the extraordinary dynamics and velvet black background make it positively spooky to listen to. Buy it for the sonics and rediscover the music! Without question, this is the definitive version of this must own album, representative of all that was good in the eighties, and all this is good about high quality vinyl represses. The mastering is, well, masterful. The sound sings out through your speakers and surrounds the listener with sonics that literally float through the air. The guitar on the track "Brothers In Arms" practicaly weeps and evokes total emotion from the listener. Toss you CD's, remastered or not, and treat yourself to this masterpiece!